Home Alone arrived in theaters 25 years ago, and it remains the #1 highest-grossing live-action comedy film of all time. 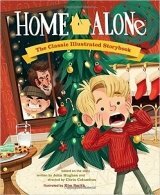 Now, illustrator Kim Smith has reimagined the story as a classic Christmas fable-complete with bumbling burglars, brilliant booby-traps, and a little boy named Kevin who's forced to fend for himself. Through a series of comic adventures, Kevin learns lessons about responsibility and the importance of family. With an amusing read-aloud story and enchanting, immersive illustrations, this charming adaptation can be enjoyed year after year alongside The Polar Express, How the Grinch Stole Christmas, and other Christmas storybook classics.